In the Catholic faith, the first and second day of November are about remembering the dead. I thought this post would be appropriate for today. In september I visited Prague in the Czech Republic. During my visit I saw many highlights of the city. There was one place I was interested in, but I couldn’t find it at first. I knew it had to be at the Wenceslas square, but that is quite big. 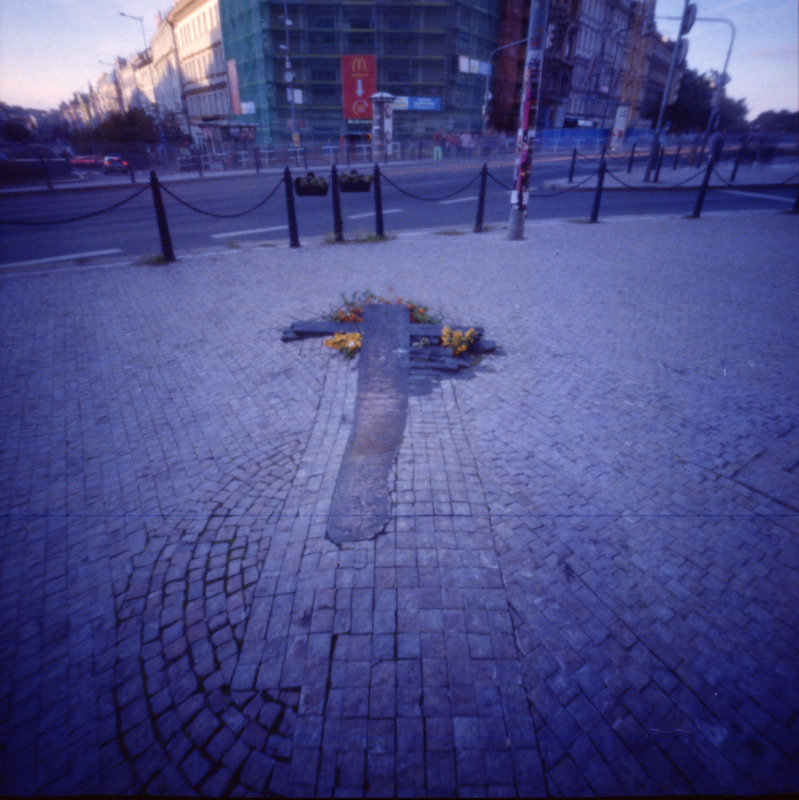 When I finally found it, I made a pinhole picture of it: the Jan Palach Memorial. Jan Palach was a student who set himself on fire in january 1969 as a protest against the Russian invasion of Czechoslovakia. He died a few days later. His death caused an uproar in Prague and on the day of his burial the whole nation held one minute of silence to remember him. This was not allowed by the Russians but people did it anyway to pay their respects to Palach. Before his deed, Palach had sent many letters to the government to protest against the Stalinist regime, the censorship, the lack of democracy in the country and pro Russian propaganda. After sending the letters, he went to the Wenceslas square and set himself on fire. Nine more people did the same after Palach died. The grave of Jan Palach was turned into some sort of shrine by people who visited it, because they thought Palach was a hero. The authorities were not happy with it, and demolished his grave. His remains were cremated and then sent to his mother. Twenty years after his death, there were many protests against the regime again, in what was to be called Palach week. These protests marked the beginning of the Velvet revolution: the fall of the communist regime in Czechoslovakia a few months later. The place where Palach set fire to himself is now marked by a bronze cross. The cross looks like burnt wood. It is placed in front of the National Museum. Oh what a great post for today! What a moving story and photo. Inge, thanks so much for posting this today. It is a beautiful and poignant. I am so glad that this blog has such an international feel. All this history is on my door step and for the most part it passes us by. I really have to second what Brendan said! I have so enjoyed reading all of the posts from different places all over the world.